Aujourd’hui, nous sommes le 5 octobre 2015, cela fait 4 ans jour pour jour que Steve Jobs, le co-fondateur d’Apple, s’en est allé. 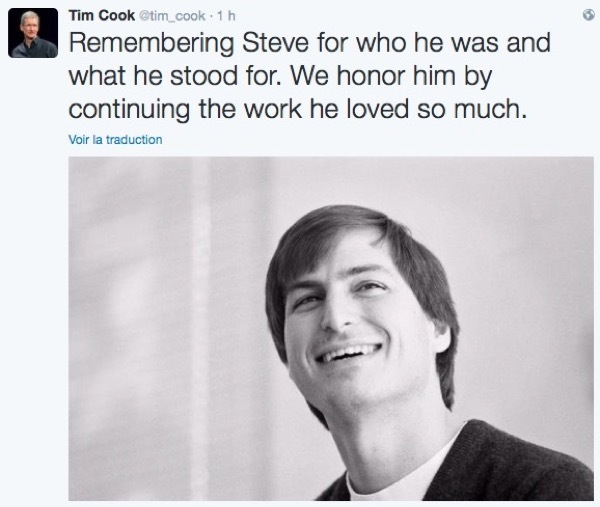 À cette occasion, Tim Cook, son successeur qui a repris le flambeau avec brio depuis son départ, lui a rendu hommage du Twitter avec ce message : « En mémoire de Steve pour qui il était et pour quoi il se battait. Nous l’honorons en continuant le travail qu’il aimait tant ». 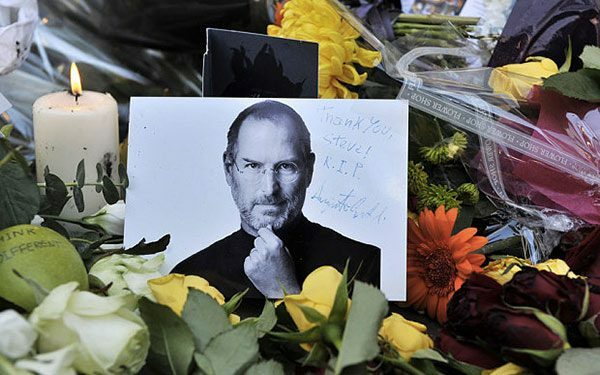 Il s’est également exprimé dans un mail destiné aux employés : « Steve était brillant, et ses priorités étaient très simples. Il aimait sa famille par dessus tout, il aimait Apple et il aimait les gens avec lesquels il travaillait main dans la main et avec lesquels il a accompli beaucoup de choses ». Today marks four years since Steve passed away. On that day, the world lost a visionary. We at Apple lost a leader, a mentor, and many of us lost a dear friend. Steve was a brilliant person, and his priorities were very simple. He loved his family above all, he loved Apple, and he loved the people with whom he worked so closely and achieved so much. Each year since his passing, I have reminded everyone in the Apple community that we share the privilege and responsibility of continuing the work Steve loved so much. What is his legacy? I see it all around us: An incredible team that embodies his spirit of innovation and creativity. The greatest products on earth, beloved by customers and empowering hundreds of millions of people around the world. Soaring achievements in technology and architecture. Experiences of surprise and delight. A company that only he could have built. A company with an intense determination to change the world for the better. And, of course, the joy he brought his loved ones. He told me several times in his final years that he hoped to live long enough to see some of the milestones in his children’s lives. I was in his office over the summer with Laurene and their youngest daughter. Messages and drawings from his kids to their father are still there on Steve’s whiteboard. If you never knew Steve, you probably work with someone who did or who was here when he led Apple. Please stop one of us today and ask what he was really like. Several of us have posted our personal remembrances on AppleWeb, and I encourage you to read them. Thank you for honoring Steve by continuing the work he started, and for remembering both who he was and what he stood for. et de leurs pensées pour Steve. Qu’il s’agisse d’amis proches, de collaborateurs ou de simples utilisateurs de produits Apple, tous ont en commun d’avoir été touchés par sa passion et sa créativité. Vous pouvez lire sur cette page certains de ces messages et lui rendre hommage ici. » rememberingsteve@apple.com.